It’s Easter! Or at least soon – but one can never have too many eggs and chocolate! 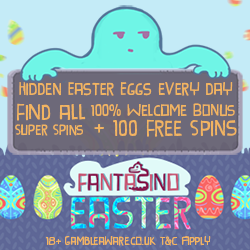 But in order to spice it up we want to tell you more about the very first Easter promotion at Fantasino Casino. We added this casino to our list a while ago and this is something special. You will be able to start a new adventure with your own Trebol. Fantasino offers more than just the latest and most famous casino games – you can explore the Fantasy World as well where different missions awaits with rewards. During Easter 2017 you can log in at Fantasino and look for hidden eggs within missions. There are also surprise eggs lying around the Fantasy World. If you’re lucky you will stumble upon one or two eggs containing free spins on selected video slots! It’s super easy! Just log in at Fantasino and start your journey. Within different quests there are hidden Easter eggs waiting to be found. When you complete missions you might find an egg lying in front of you. Touch the egg in order to see what’s inside – free spins on a special video slot at Fantasino. These spins will be placed in your Trebol’s wardrobe. You can find up to two eggs in one single quest. There are random Easter eggs as well and you can find up to five of those eggs each day during the promotion. Depending on what you do while you’re logged in you will receive an egg. One of the best things about the Easter bonus spins at Fantasino is that the winnings are free from any wagering requirements meaning you can make a withdrawal whenever you want to. Even though the goodies with Easter eggs full of free rounds on slots sounds great enough we are happy to tell you that there are bonuses waiting on you every day during the promotion period. Every day when you log in at Fantasino you will be able to claim a new deposit bonus. Just select the bonus offer before you make your deposit and you will get it. It’s something new every day and it varies between bonus money (it can be 100% extra! ), free spins and cash backs. You don’t want to miss out on the Easter campaign 2017!